Tonight, you have the chance to hear an astounding story. It involves the likes of Berkshire Hathaway’s (BRK) Warren Buffett… former Presidents Barack Obama and Bill Clinton… and three Wall Street billionaires. And you, too, if you’re interested. In fact, as a result of this new venture, you could make an extraordinary amount of money. That is, if you prepare today. Starting tonight, the man that CNBC called “The Prophet” could help you make a fortune in 2019… in a radical new way. Whitney Tilson is one of the best-known and most-connected men on Wall Street. He’s managed a hedge fund… obtained two degrees from Harvard… and appeared in the pages of about every major financial newspaper. He knows about everyone, and probably has a picture and story about when they last met. And today, he’s launching a new publishing business to help folks like you survive and thrive with your investing and retirement accounts. Already, nearly 100,000 folks have signed up to listen in. I hope that you’ll join them tonight at 8 p.m. Eastern time to listen to his newest prediction. He plans to share which investments you absolutely must buy now… which you should avoid (like the company featured in the essay we’re sharing from Whitney below)… and why using his strategy could change your approach to making money forever. Attendance is free, but a reservation is required. Click here to reserve your seat. Ever since I (Whitney) got burned shorting the stock in 2013 – watching it march higher from $35 to $205 a share – I’ve warned my readers about betting against CEO Elon Musk and his team. They’ve simply pulled too many rabbits out of their hat over the years. But Tesla has almost done too good of a job. Now, it faces a massive wave of competition. Electric cars from high-end European manufacturers Audi and Jaguar are already vastly outselling Tesla’s Model S and Model X cars in Europe. Meanwhile… Toyota, Kia, Hyundai, Volkswagen, Nissan, and Renault are developing their own lower-priced electric vehicles. I believe Tesla’s stock – which closed recently around $267 a share – will be trading below $100 by the end of 2019. As Steven so generously pointed out above, I’ve made some big calls – but I only do so when three things line up perfectly, as I believe they do now for Tesla: the fundamentals, my “boots on the ground” research, and investor sentiment. The company’s fundamentals are terrible. Demand is weak, inventories are piling up, and investors are finally starting to lose confidence in Musk. It delivered 63,000 vehicles in the first quarter – far lower than Wall Street’s estimates of 76,000. That number represented a stunning 31% drop from the previous quarter. The stock got clobbered on the news, falling more than 8% in the following day’s trading. But the miss wasn’t a surprise to me, thanks to the behind-the-scenes research I’ve been doing. For years, I’ve warned my short-selling friends about shorting Tesla. It’s extremely dangerous to short open-ended growth stories based on fundamentals alone. The company has indeed grown its revenues nearly 200 times over the past decade, and its cult-like followers step in to buy on every dip. Trying to short a stock like that is a good way to get your face ripped off. As it turns out, I still have the app on my phone that allows me to track my old car’s location, so I was curious to see what Tesla did with it. The answer: Not much. The company immediately moved it to a used-car facility where it has been sitting in an open lot ever since, all winter. The battery has long since drained to zero. It just sits there, losing value every month. Something isn’t right here. Why isn’t Tesla selling it? Is it even trying? Why isn’t the company periodically charging it to keep it in good enough shape to sell at some point? How is it accounting for this car? Has it taken a write-down? How many more cars are there like mine? 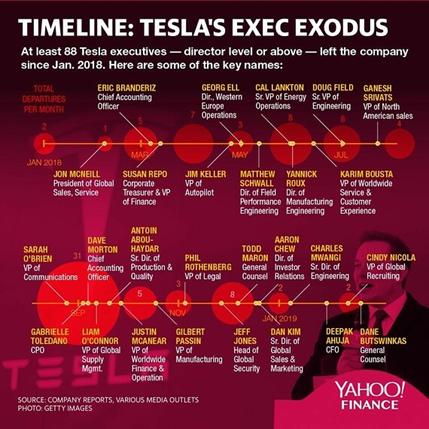 Notice how heavily skewed the departures are in the legal and accounting areas of the company. That’s exactly what you would expect to see if fraud is occurring. That’s easy to do with new, innovative products – which early adopters eagerly buy. But very few such products go mainstream. For every blockbuster hit product like Apple’s (AAPL) iPhone, dozens of others fizzle out. No doubt, Tesla’s cars are extremely appealing for wealthy, environmentally conscious tech lovers who are willing to spend a lot of money to drive a cool new toy. But that’s a niche market. Tesla recognizes this, which is why it developed its much-hyped, lower-priced Model 3. But as Glenn discovered, it’s not nearly as good of a car. So it’s not surprising that once Tesla fulfilled the big backlog of demand from early adopters, sales appear to be falling off a cliff. I don’t think the big sales shortfall in the first quarter is a one-time hiccup. Instead, it’s likely a harbinger of things to come. Sales are going to be under even more pressure as competition ramps up. And even if Tesla’s big price cuts stimulate sales, what will that do to the company’s margins? It’s not clear, for example, that Tesla makes any money at all selling the lowest-priced ($35,000) version of the Model 3. Galileo Russell, the young millennial host of a finance-focused YouTube channel, gained the Tesla spotlight last summer when Musk cut off “bonehead” Wall Street analysts on an earnings call and instead had a conversation with the 25-year-old. It’s a credit to Russell that he’s beginning to question all the insane, inexplicable things that the company and its CEO are doing. Most people I’ve found do the opposite once they’ve committed to something, especially if they’ve done so publicly: They dig in their heels, block out disconfirming information, and attack anyone who questions them. In contrast, Russell hosted a 28-minute YouTube video last month with his tens of thousands of followers in which he outlined his concerns and practically begged Tesla to raise money. Why it hasn’t done so remains a great mystery, but its failure to do so could be its undoing. They’ve successfully navigated through one crisis after another for years now, thanks mainly to huge demand for their cars. But now that this appears to be ending, I think their luck has run out. In fact, I’m so sure that this is the beginning of the end that last month, I offered a friendly wager. I put $10,000 of my own money on the line and challenged Tesla bulls that if the company reports even one profitable quarter this year, I’d donate to the charity of the winner’s choice. A dozen of my readers – including my friend and famed short-seller Andrew Left, who’s super-bullish on the stock – took me up on the bet! After this week’s news, I’m more confident than ever before that they are going to need their checkbooks by the end of the year. I’m appearing on camera tonight to discuss my biggest investment prediction in 20 years. I’ll be giving away the name and ticker of my No. 1 retirement stock in America just for tuning in. I hope you’ll join me. Again, you can save your seat by clicking right here. Monday, You Paid Your Federal Taxes. Tuesday Was the Real Tax Freedom Day. Americans will work for 105 days of the year to pay their collective $5.42 trillion tax bill – a figure equal to about 29% of Americans’ incomes. President Trump’s tax cut was really a tax cut… even if few in the media like to acknowledge it. Health entitlements – Medicare, Medicaid, Obamacare – and Social Security are the largest and fastest growing programs. Unless Congress fixes these four programs, they – and the ever-growing interest payments on the national debt – will consume every dollar of taxes paid by 2041. That leaves no money for anything else. These stores aren’t coming back. Less than halfway through April, American retailers have announced plans this year to shut 5,994 stores, exceeding the 5,854 announced in all of 2018. This is a long time coming. But is it too late? The 3.8% U.S. unemployment rate has exacerbated a skilled labor shortage that had been building for years. To turn the tide, American’s blue-collar industries are adopting a blunter recruiting approach by touting how new entrants can earn more than some college graduates, without incurring tens of thousands of debt.